The Open House is Finally Here! This Saturday from 9am - 2pm, South Hill Forest Products will be running its annual Open House at the Sugar Bush (located at the end of Rich Road off of Coddington)! As usual, it will be a great time! We are going to have free pancakes, live music, face painting, bush tours, tree identification walks, wood splitting demonstrations, craft tables, and of course selling the wonderful products that we worked hard on making! Maple Syrup, Hickory Syrup, Soap, Salves, and Hand Carved utensils! We've been busy as bees here on South Hill over the past few weeks. As soon as our trees were tapped sap was flowing out like a river and before we knew it our first syrup boil of the season was upon us. The TAs showed the students the ropes of wood splitting, fire building, and sap boiling and 36 hours later we had our first 2.6 gallons of delicious Golden Delicate Maple Syrup. Fast forward just a few weeks and we are on hour 42 of our 3rd and biggest boil of the season thus far. It is incredible to see how much people can learn in such a short period of time when they are working out working in the field; the students are now running the show all by themselves! Between sap collection, boils, and syrup bottling tending to our various other products have kept us more than busy. Soaps and salves are being made with our very own beeswax, our PoHu and Pink Oyster mushrooms are being harvested every single day, and a new line of products is being developed. What is the new line of products, you ask? Hand carved wooden utensils including spoons and knives carved by all of us over here at SHFP. Jason, the TAs, and the students alike are loving (maybe a little too much) learning how to whittle various things and care for carving knives. The lab is constantly covered in wood shavings no matter how often we sweep. Keep an eye out, these beautiful, hand-crafted utensils will be on the market soon. And don't forget, Saturday, April 18th is the date of the South Hill Forest Products Open House! There will be pancakes, live music, tours of the Sugar Bush, wood splitting demos, and lots of happy, maple-loving people enjoying the sunshine. You won't want to miss it! Stay on the look out for more information. On Wednesday, the new South Hill Forest Products team started tapping trees at the Sugar Bush! With our first day of warmth in Ithaca (35 Degrees! ), We weren't sure that we would get sap immediately. But we are in luck, syrup season has begun! The crew is working hard on reading up on maple syrup, cleaning buckets and tops, cutting brick, buying brand new stainless steel spouts, shoveling up the Sugar Bush, and so much more. We are so excited to start the season. Wish us luck on a productive year! Here's the new South Hill Forest Products team! Hi everyone! As you know, we here at South Hill Forest Products produce maple syrup, and this past week we visited SweeTrees Maple Products in Berkshire, NY. We wanted to see how a larger maple producer operates. Here on South Hill we have 100 tapped trees, at SweeTrees they have 10 times more trees tapped with fewer workers. Instead of hanging buckets on trees, they use a tubing system that connects the trees to a central pipe. At the collection end, a pump coxes the sap downhill from the trees to their sugar shack to turn the sap into the maple syrup! Dan, from SweeTrees, giving us a tour of their tapped trees and tube system. 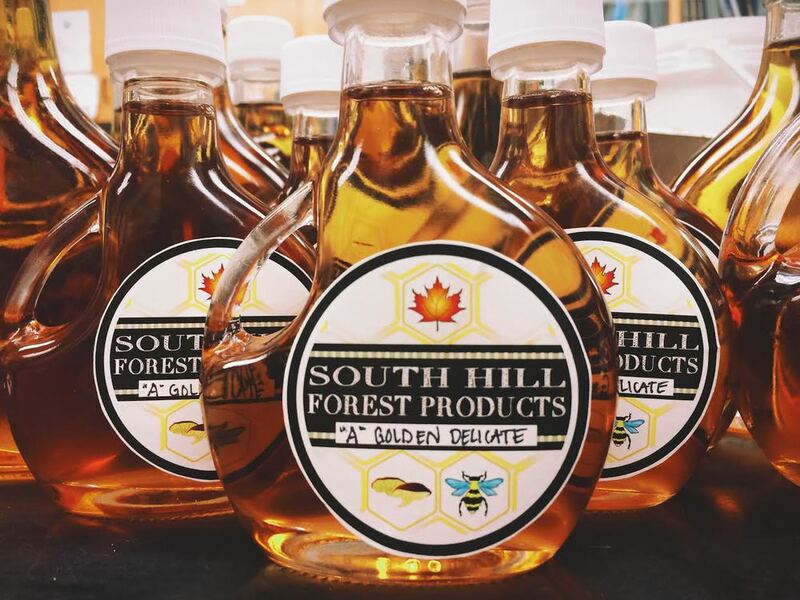 As far as non-timber forest products go, things have been pretty quiet up here on South Hill over the past few months, but never fear syrup, honey, and mushroom-lovers of the world; South Hill Forest Products has awoken from our annual hibernation! We are already taking on the year with a brand new batch of excited and dedicated Ithaca College students who have been busy as bees over the past week. In just seven days we have gotten the mushroom room up and running, Pink and Pohu Oyster mushroom spawn ordered, syrup-season preparations underway, and a batch of hickory syrup ready to go through a taste test. This season is sure to be a special one (not that every single season with us isn’t). We have a new logo, some potential new products such as hickory syrup, and plans to expand upon some past experimental products such as our beeswax soap. Perhaps the most exciting news for this season, however, is the development in our maple sugaring operation. Chris Sinton, a professor in the Environmental Studies and Sciences department here at Ithaca College received a grant to research fuel efficiency for various small-scale maple syrup boiling methods. This year we will be using a brand new evaporator alongside our two boiling pans to begin testing the efficiency of the various methods. Stay tuned; our mushrooms are just around the corner! Check out our new South Hill Forest Products Logo!